This popular practitioner guide and course text takes the reader step by step through diagnostic decision making in mental health. Acclaimed for both the clarity of his writing and his clinical expertise, James Morrison provides principles and decision trees for evaluating information from multiple sources and constructing a valid, clinically useful working diagnosis. More than 100 vivid vignettes--from the straightforward to the toughest cases--illustrate the practical application of these methods. Essential topics include developing a differential diagnosis and dealing with comorbidity. *Updated resources and suggested readings. See also Morrison's DSM-5® Made Easy, which explains DSM-5 diagnoses in clear language, illustrated with vivid case vignettes; The First Interview, Fourth Edition, which presents a framework for conducting thorough, empathic initial evaluations; and The Mental Health Clinician's Workbook, which uses in-depth cases and carefully constructed exercises to build the reader's diagnostic skills. James Morrison, MD, is Affiliate Professor of Psychiatry at Oregon Health and Science University in Portland. He has extensive experience in both the private and public sectors. 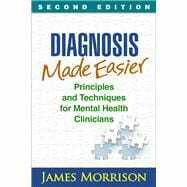 With his acclaimed practical books--including DSM-5 Made Easy; Diagnosis Made Easier, Second Edition; The First Interview, Fourth Edition; and When Psychological Problems Mask Medical Disorders, Second Edition--Dr. Morrison has guided hundreds of thousands of mental health professionals and students through the complexities of clinical evaluation and diagnosis.